When Panos graduated from Northeastern University with a degree in industrial engineering and several job offers in that field, he could have made a smooth transition to a rewarding career as an engineer. Yet something was pulling him in a very different direction–toward the Master of Divinity program at Holy Cross. 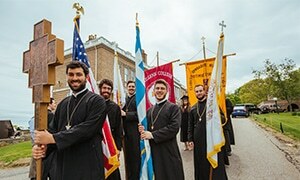 “I grew up coming to lots of events on this campus and also got to know a number of seminarians at the Metropolis camp,” the St. Methodios Faith and Heritage Center in his home state of New Hampshire. “Meeting those seminarians and hearing them chant had quite an impact. Their zeal really rubbed off on me,” he recalls. “And while I was still in college, I got involved with a variety of Church ministries and became program director at the Metropolis camp,” a position he still holds. 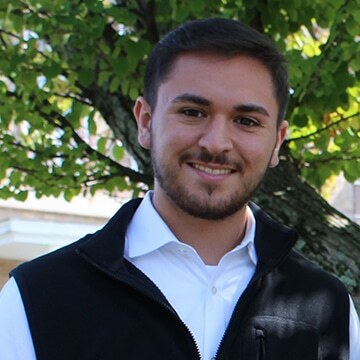 Now in his second year as a seminarian, Panos says, “It’s great to be in a community of people so passionate about the Orthodox Faith and the future of the Church.” Enthusiastic about all of his courses, he especially enjoys learning New Testament Greek and Liturgics.